Hi guys! How is everybody doing? I hope fine :-). As I'm typing this it's already past 3am over here, I'm so nocturnal, it's insane! Anyway, before I go to bed, I want to show you another H&M polish, one that belongs to the same line as the one I showed you yesterday. Meet 'Creme de la Creme' by H&M. I'm having a really hard time restraining myself from typing 'Creme de la Menthe' though, haha! This golden polish remained untried for so long, because I really wasn't feeling the dull golden color. When the first stroke of polish finally hit my nail, I almost kicked myself for not trying it sooner. I was pleasantly surprised to see this wasn't just any gold! Creme de la Creme is actually a fine mix of silver and golden particles, I kinda like it! I do think the overall color could've been more vibrant, but I can imagine this polish would pop more on a sunkissed hand. 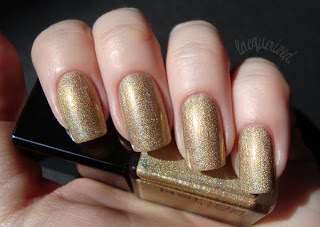 Creme de la Creme consists out of a gazillion fine holographic glitters, it's really subtle and delicate. It only took two coats, a lot of smoothness and major quick drying, to decide its application is pretty great! Well, I'm off to sleep, good day and night to all of you! Thanks for stopping by and take care.